Synopsis: Jed Cabot, a frustrated, middle-aged writer, makes a spur-of-the-moment decision to leave Los Angeles and go back to New York, where he lived aimlessly in his twenties, planning to write his own “Last Tango In Paris.” But the plan unexpectedly changes when Jed meets Christine, an angel in disguise who detours him deep into his own soul and back. 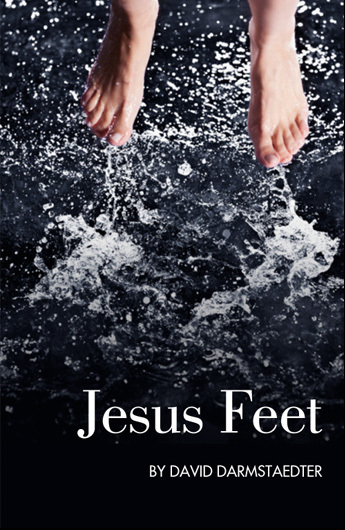 Jesus Feet is a story filled with temptation, surrender and love; an examination of what confronts all men, and what men must go through in order to move forward in their lives. "A restitched life, awesome read"
David Darmstaedter conjured up his latest character, Jed, a writer reeling with ideas, flashbacks of a raw past of physical/chemical pleasure and a roller coaster ride of bouts of self-loathing, loss of confidence and uncertain hope, who hacks a jagged path through temptations toward a fragile peace. I personally am not a "religious" kind of guy in the sense of whether Mohamed or Jesus or Buddha or some other of the 2000 different religions hold an answer or not, but Jed seems to find a sort of answer..... in his own Jesus feet. Read it.